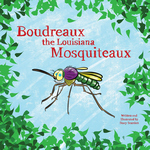 Fun wordplay including rhyme, alliteration, and onomatopoeia follow a pesky mosquito as she buzzes about the forest. This little insect makes a nuisance of herself to all the other animals and ignores their frustrations with her. She continues on her way until she finally bothers the wrong neighbor. A list of mosquito facts appears at the end with informative material about the story’s main character and one of her forest foes. 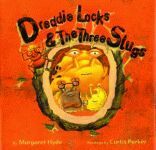 Virginia Kroll is a prolific children’s author whose work has received numerous awards. Among her accolades are three Benjamin Franklin Awards, a Jane Addams Peace Association commendation, a Skipping Stones multicultural book award, a KIND Children’s Book Award from the Humane Society of the United States, an Outstanding Trade Book in the Field of Science, and an International Reading Association/Children’s Book Council Children’s Choice Award. She is also the author of The Thanksgiving Bowl from Pelican. She lives in Hamburg, New York. Betsy LePlatt is a freelance designer and illustrator. She has worked for an advertising agency, corporate art departments, and product design departments. Her clients have included General Mills and Anagram International. LePlatt lives with her husband and daughter in Chanhassen, Minnesota. 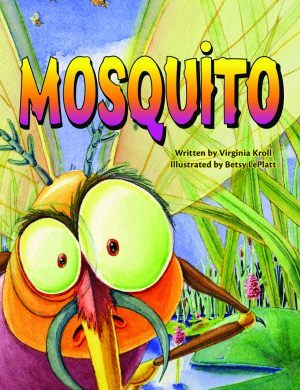 Mosquito by Virginia Kroll (Pelican, 2011) pairs alliterative rhymes with exuberant watercolor illustrations in a tale about a mosquito that bites various critters before being swallowed by a bat. Click here for the bat mobile activity to accompany Mosquito.